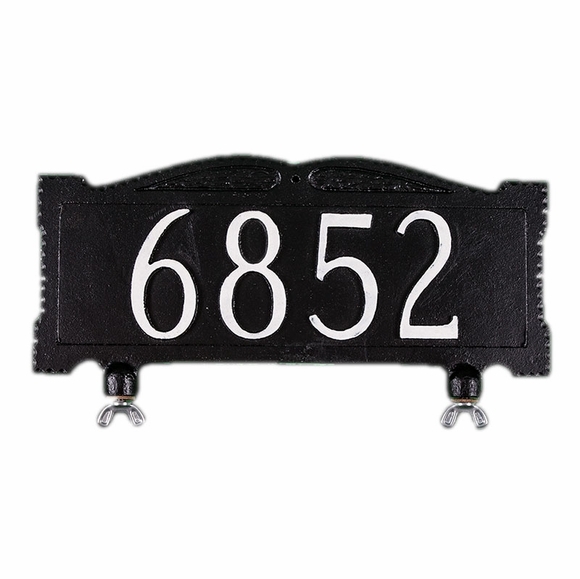 Custom 1 Line Mailbox Sign with 3" High Numbers - - attaches to the top of your existing mailbox with the included hardware. The same text appears on both sides of this personalized address plaque. Holds up to five 3" high characters including spaces. Please type the text you desire in the box above. What is the distance between holes? A: The center to center hole distance is 7.75". Well worth the price and wait, not that either were excessive. Very high quality and sturdy. We're only in our early 60s but it will undoubtedly outlast us. Great purchase!